At a low-profile briefing on Capitol Hill in 2016, officials from Statoil, the Norwegian oil and gas company, told members of Congress that the firm would back a carbon tax. Then earlier this year, Shell Oil Co. lobbyists met several times with Republicans and Democrats from both chambers to say the energy giant would support a nationwide price on carbon emissions. These are rare examples of oil majors urging elected officials to pass sweeping legislation to address climate change. The meetings raise comparisons between the companies' public claims to support carbon taxes with their efforts to actually pass one. Most of the majors have said for years that they support the controversial policy. E&E News reviewed hundreds of lobbying records filed between 2015 and this year by lobbyists working for BP PLC, Chevron Corp., Equinor ASA, Exxon Mobil Corp., Royal Dutch Shell PLC and Total SA. (Statoil changed its name to Equinor in May.) The analysis also included lobbying forms submitted by industry trade groups. Three companies — BP, Exxon and Shell — lobbied 17 times on carbon tax bills, related resolutions or carbon taxes broadly. It's a sliver of their lobbying efforts. In most cases, it's unclear whether they lobbied for or against legislation, including measures that opposed carbon taxes as an economy-crushing policy. None of the firms, when contacted, would answer questions about their message to lawmakers on specific provisions. "We have met with numerous members of Congress to express our views about the principles we support regarding a carbon tax," Exxon spokesperson Scott Silvestri said in an email. During the four-year span, the six firms together spent more than $120 million to lobby Congress. A tiny fraction went to advancing, or opposing, the prospects of a carbon tax. That didn't catch observers by surprise. "The only data point I have in the world that I inhabit is that Exxon Mobil did throw in with the Climate Leadership Council," said Bob Inglis, who advocates for taxing carbon as director of the conservative environmental group republicEN. "That's about all that I know I've seen." Exxon, along with BP, Shell and Total, joined the Climate Leadership Council in June 2017 to indirectly push for a $40-per-ton levy on emissions. AFPM issued a statement earlier this year supporting a House resolution that claimed a carbon tax would sink the U.S. economy. The trade group argued that the policy would increase the cost of energy and "disproportionately impact middle- and low-income families." Yet all six oil companies have publicly stated, in one way or another, that they would support a carbon tax in the U.S. 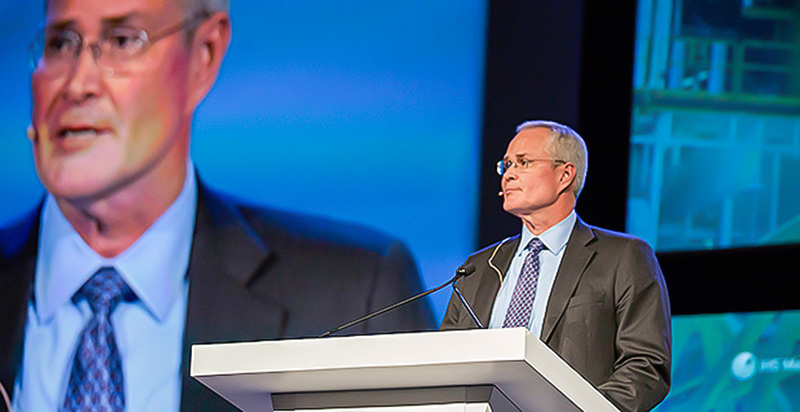 In his first public statement after being named Exxon's chief executive, Darren Woods endorsed a revenue-neutral carbon fee. But neither Woods nor his lobbyists have pushed for the passage of existing legislation to impose the fee, said Sen. Sheldon Whitehouse (D-R.I.), who has introduced a carbon tax bill with Sen. Brian Schatz (D-Hawaii). "I am the author of the only carbon price bill in the Senate, and I have received no support for it from the oil majors," Whitehouse said in an interview. "Or any support to work on negotiating a bill that they could support." Lobbying disclosure forms show that Exxon repeatedly lobbied on Whitehouse's bill, the "American Opportunity Carbon Fee Act." Records show in-house lobbyists met with members of the Senate and the House multiple times since 2015. Laws that govern federal lobbying don't require disclosure forms to specify whether someone, such as an advocacy group or a corporation, supported or opposed a bill. Asked about Whitehouse's bill, Silvestri declined to say whether the company lobbied for or against it. At the end of 2016, Exxon lobbied on "all provisions" of an anti-carbon tax resolution by Rep. Steve Scalise (R-La. ), according to a lobbying form filed by the company. The measure had a single message: Carbon taxes are "detrimental to the economy of the United States." It passed easily. Exxon also lobbied on Sen. Bernie Sanders' (I-Vt.) carbon tax bill, which called for an escalating price on greenhouse gases that would have started at $15 a ton and ended at $73 in 2035. It never received a vote, and it's unclear what Exxon said about it to lawmakers. On the state level, Exxon opposed two carbon tax bills in the Massachusetts Legislature in 2016 (Climatewire, Jan. 27, 2017). Before President Trump's surprising electoral victory, the industry braced for a Hillary Clinton presidency — and an increase in environmental rules. So it dispatched teams to Congress to broach the idea of a carbon tax deal. "In the fall of 2016, oil companies were going around the Hill talking about carbon pricing with members that you think would be intransigent, or I would assess as being swing votes, on any carbon bill," said a source familiar with the talks. They met with energy-state lawmakers in both chambers and from both parties, the source said. "That's probably where they have their strongest relationships." George Frampton, co-founder of the Partnership for Responsible Growth, which advocates for taxing emissions, said companies were calculating what might have happened under Clinton. "I think there were a number of companies and some manufacturing companies talking a lot about whether they might zig rather than zag if Hillary were elected," Frampton said. "How serious that was, I don't know." He added: "I don't think it's entirely gone away. I think those people are still kind of talking to each other." Shell Oil has convened regular meetings to discuss carbon taxes with environmental and industry groups since early 2016 (Climatewire, Sept. 6). The meetings sprang up naturally from the small community of climate experts who work for oil companies and research institutions in Washington, D.C., according to sources. With carbon taxes on the agenda, they met for lunch, talked by phone and traded emails. After Trump's election, interest increased among oil industry officials in a federal carbon tax, according to some observers. "They believe this is inevitable," said Jerry Taylor, president of the Niskanen Center, a libertarian think tank that supports pricing carbon. "It may not be during this administration. It might not be the next. It will happen within a decade or two." Rather than butting heads with regulators and lawmakers, oil giants "would far rather settle," Taylor said. Exxon, for instance, said in an emailed statement that it would support carbon pricing only if the policy replaced the "patchwork of literally thousands of regulations, laws and mandates today that have the effect of putting a price on carbon in a costly, inefficient way." Last year, a Chevron spokeswoman told E&E News that the company "does not support general calls for implementing a price on carbon" (Climatewire, April 14, 2017). Now, Chevron says it backs a carbon tax, under certain terms. It would have to be a "well-designed policy" that results in the "lowest-cost emissions reductions," promotes "global engagement" and includes "broad sectors of the economy," spokesman Sean Comey said by email. "The details matter," Comey said. Still, the oil industry is diverse in its carbon tax perspectives. Some companies, particularly European operators, have spoken more pointedly about the warming effect that drilling has had on the planet and their role in addressing the problem. 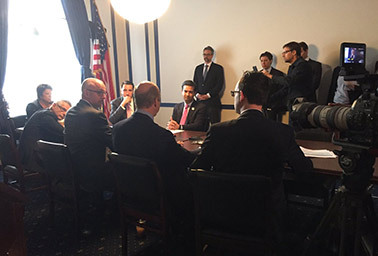 "I think it's pretty well-known that a lot of the foreign companies are more comfortable or accustomed to this than American companies and showing that they can thrive in that environment," Rep. Carlos Curbelo (R-Fla.), who has met with Shell this year to discuss carbon taxes, said in a recent interview. Concern about curbing climate change has, for many years, been seen as a Democratic cause. But that has slowly changed, in part because oil majors have acknowledged that fossil fuel production has contributed to warming the planet. At the first meeting of the House Climate Solutions Caucus, a group comprising 88 lawmakers, representatives from Statoil told the group that the company supports carbon tax bills because of their "simplicity" and "fairness." Still, Inglis, a former Republican congressman from South Carolina, said he has had trouble rousing support from majors for a carbon tax, even though their positions align. "We're constantly begging all of the above for help," he said of the oil majors. "You can't count on a corporate entity to lead change. You can count on a company to jump on when the train is moving."